A lot of the Azzurri's success has been founded on a resilient and strong defensive unit, as the emphasis is placed more on a solid backline than aesthetic football. 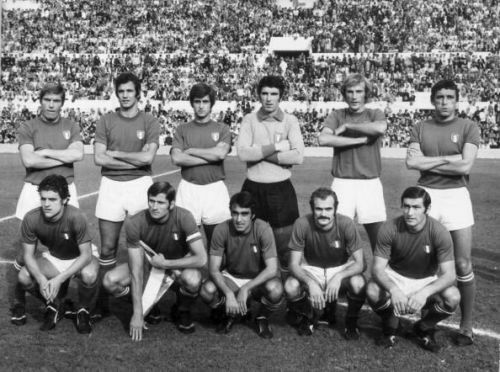 With four World Cups and one European Championship under their belts, the Italian national football team is one of the most successful sides in history. The Italians popularized the 'catenaccio' (door bolt) brand of football through Helenio Herrera's legendary Inter side of the 1960's, and though Italy has produced iconic attacking players such as Paulo Rossi, Alessandro Del Piero, Francesco Totti and Roberto Baggio, it is for their legendary defenders that they are most famed. There have been exceptional Italian teams ditto defenders throughout history, including the back-to-back World Cup-winning sides of 1934 and 1938 and the mythical 'Grande Torino' team who won five consecutive Scudetti in the 1940s, (but lost most of its members tragically in the 1949 Superga air disaster). However, for a more objective breakdown, due to limited in-depth access to abilities and statistics of those players, this list is consigned to just the last 50 years. Here are the ten greatest Italian defenders of the last 50 years. The first of a trio of defenders who formed the backbone of the formidable defence of the Juventus and Italian sides of the 1970s and 80s to feature in this list, Cabrini was voted as the best young player at the 1978 World Cup in Argentina. At that tournament, he helped Italy to a third-place finish, before contributing to their triumph in Spain four years later. A left-back in his heyday, Bell'Antonio ("beautiful Antonio'') made his name at Juventus after his transfer from Atalanta in 1976. He went on to spend 13 highly successful years in Turin with the Bianconerri, winning the Serie A six times, the Coppa Italia (Italian Cup), one UEFA Super Cup, one UEFA Champions League, one UEFA Cup and one Intercontinental Cup. With the Italian national team, Cabrini made 73 appearances in 9 years between 1978 to 1987 and played in every single one of Italy's World Cup matches between 1978 and 1986. Playing a leading role in their 1982 triumph, he delivered the pin-point cross for Paulo Rossi's 2nd-minute opener in their quarter-final 3-2 surprise win over Brazil. He also became the first player in history to miss a penalty in a World Cup final after his 25th-minute attempt from the spot was blasted wide off the goal in the 3-1 win over West Germany. He is one of only six players to have won all UEFA and FIFA club competitions during his time; European Cup, European Cup Winners Cup, UEFA Cup, UEFA Super Cup and the Intercontinental Cup (all achieved with Juventus). Burgnich began his club career at Udinese and Juventus with relatively little success (making few appearances but winning a Serie A title at Juventus) in his three-year stay at both clubs. He transferred to Palermo in 1961 and became a regular, but it was his transfer to Inter Milan a year later that cemented his legacy as one of the greatest defenders of all time. A core member of Helenio Herrera's legendary 'Grande Inter' side of the 1960s, Burgnich's pace, stamina, offensive and defensive efficiency were crucial to the immense success of the catenaccio system under Herrera, where he won four Serie A titles, two European Cup and one Coppa Italia before his departure to Napoli in 1974 where he added the Coppa Italia of 1974 to his trophy collection. With Italy, Tarcisio Burgnich was an important member of the national setup in the 60s, participating at three FIFA World Cups, including the side that finished as runners-up in the 1970 World Cup. He won a total of 66 caps for the Azzurri between 1963 and 1974 and was a part of the team that won Italy its first and till date only European Championship on home soil in 1968. Nicknamed "La Roccia" (The Rock) due to his imposing style of play, Burgnich was a versatile defender who was capable of playing anywhere across the back as his technique and physique meant he was suited to playing as a right-back, centre-back or a sweeper. He put up one of his best international performance at the 1970 World Cup, scoring a goal in (what has been dubbed "The Game of the Century') semi-final clash between Italy and Germany which Italy won 4-3 (after five goals had remarkably been scored in extra time). His superb defending skills meant he was an efficient man marker and he was assigned the task of man-marking Pele in the 1970 World Cup final and was beaten by the Brazilian to a header in Italy's 4-1 loss. He famously quipped after the match, "I told myself before the game, 'he's made of skin and bones just like everyone else' — but I was wrong." Burgnich is rightly regarded as one of the greatest Italian left-backs of all time and his partnership across from Giacinto Facchetti is considered one of the best full-back partnerships in footballing history, as Burgnich complemented Facchetti's attacking forays with an old-fashioned, hard tackling defensive style.